Mild and dry weather has seen much of the Southern French Alps experiencing snow and ice conditions more typical of autumn than late January. No significant dumps of fresh snow since new year has left even the high ski areas fairly dry and some of the lower sunny ones distinctly grassy! Many of the lower cascades are dry, thin or simply not there. Folk have been finding the odd cascade by driving and good, mild conditions have encouraged a few folk onto the Ecrin N. Faces like the Rateua and Pic Sans Nom. 12/1/06 Mont Blanc du Tacul, Chamonix. Mixed and mild weather has seen less folk out climbing over the last week or so and the lack of fresh snow has meant the skiing is still poor. However a few keen parties have been out on Mont Blanc du Tacul which is still giving good conditions on routes such as the Modica Noury, Scotch on the Rocks and the Supercouloir direct start. On Pointe Lachenal folk have climbed Voie Pellisier and M6 Solar. This latter route provides a good short day with 4 pitches up to about Scottish V. It's been popular this year due to the fine icy runnels that have formed on it. It's possible to leave your skis at the top of the route, walk round to the base of the crag, climb the route and ski off down the Vallee Blanche. 29/12/06 Supercouloir, Mont Blanc du Tacul, Chamonix. The upper Supercouloir has been icy for the last couple of months but more recently the direct start has gained a significant amount of ice and is providing a number of teams with 2 superb pitches of icy mixed climbing with convenient rap points for descent. The upper ice pitches are fairly fat just now and seem less steep than the guide book suggests (sustained Scottish IV). Mark Thomas and I climbed the direct start and continued over the summit of Mont Blanc du Tacul - providing a fine winter alpine outing. Continuing perfect winter weather and good ice in Chamonix mean many teams have been out enjoying the good conditions. Numerous different routes were completed on the Midi North Face today from Fil a Plomb on the East side of the Face to the Eugster Direct (which is very icy compared to when I climbed in it May) round on the North West Face. Mark and I enjoyed good conditions on 'Fil a Plomb' which provided 3 long icy pitches and a lot of easy snow - much of which was excellent neve. Numerous other teams, including some guided parties, climbed the North Face of the Col du Plan in very comfortable freak to freak style whilst other climbers 'rolled the dice' on the Chere Couloir and variants just left of the Frendo Spur. Excellent Ice conditions on the Petite Jorasses turned the modern test-piece 'Omega' into a thin ice route rather than a mixed desperate. First free climbed in December 2004 by Nick Bullock and Stu Mcaleese the route has now had a number of free ascents by French, Italian and, most recently, 2 strong British teams. Andy Houseman and Neil Brodie climbed the route from the Leschaux hut - to the summit of the Pettite Jorasses and back - in a single day push. 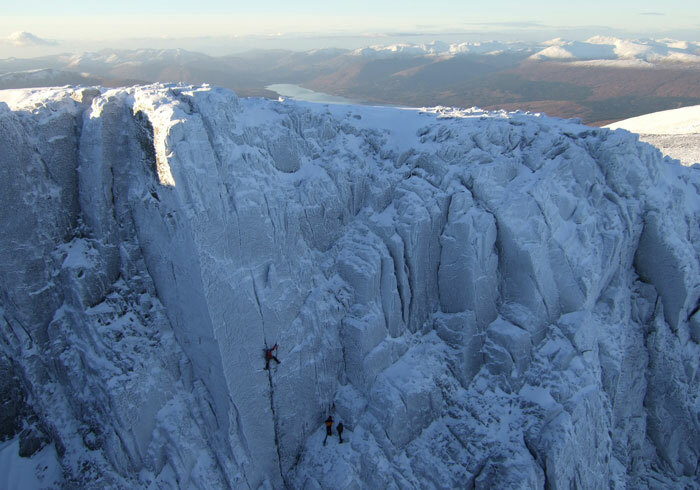 Andy reported brilliant thin ice climbing and whilst the difficulties were perhaps considerably eased by the presence of more ice - it clearly was still not a 'romp'....as Andy's photo shows! A few days before Andy and Neil's ascent Omega had also been climbed by Kenton Cool and Neil Mcnab. Sustained cold temperatures at Cogne have seen the spring fed routes building rapidly and things are in much better shape than a week or so ago. Up the Valnontey both Patri lines have formed and Repentence was there - if rather thin, it should only get better. We climbed a L hand variation to Flash Estivo which gave good thick, soft and wet ice at about Scottish IV/V. The Lilaz valley had some good options too with reports from the Cafe book describing Sudori Fredi as Tres bon and Cold Couloir and Coyote as OK. The Cappuchino in the Cafe Licone was as good as ever! Teams leaving the Aguille du Midi telepherique this morning were greeted by 100km/hr winds and temperatures of -20C. The resulting wind chill and amount of snow being blown around made the prospect of leaving the station fairly unpleasant never mind doing a route! The 'brave' souls that did depart....were back in about 3 minutes! The first Midi 'freak' and the Abri Simond Hut have been busy with folk enjoying the excellent early winter weather and goulotte ice conditions on Mont Blanc du Tacul. Teams have been climbing many of the classic Tacul goulottes in excellent 'fat-ice' conditions including the Gabarrou Albinoni and Modica Noury, pictured left. Andy Houseman and I climbed Stevie Haston's other line on this face. Pinocchio provided 8 excellent sustained ice and mixed pitches up to about Scottish VI,7. The amount of ice probably made it considerably easier than many other ascents in recent years where folk have reported sketchy and not always well protected mixed climbing.